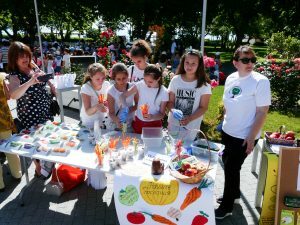 160 students and pupils from 15 different Bulgarian schools and kindergartens met at Eco festival “Live Responsibly” in Burgas to present various activities and materials they had prepared for visitors. Mainly, students shared their experience and knowledge gained thanks to their teachers engaged in “We Eat Responsibly” project. 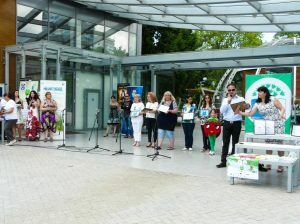 The festival was situated at the beautiful and strategic Exposure Flora Centre in Burgas. This location was ideal for attracting not only other youngsters and children, but also many local citizens and some curious tourists. There were official guests along with representatives from the Municipality and the Regional inspectorate of Ministry of education and media. Students wanted to use their new knowledge about food issues. They prepared various workshops, activities, interviews, cooking competitions and exhibitions. The Rayna Knyaginya kindergarten had organized a game “Taste, Guess and Tell”, in which children could guess the type of food they tasted and tell what they knew about it. Kids could also do puzzles of different food, learn something about cereals or learn about different seasonal and local foods. Other kindergartens organized a workshop “I cook responsibly with my mom” and even an interesting fruits and vegetables fashion show. There was also an exhibition of children´s drawings, posters and creative verses. The visitors could stop by and read a seasonal calendar of responsible consumption and seasonal recipes for each part of the year, prepared by Anton Strashimirov school. 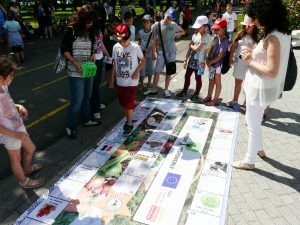 These students also organized another activity – mapping of agricultural products on the map of Bulgaria, stressing the “100-miles-rule,” using only food produced within this distance. Then they calculated the CO2 emissions caused by food transportation. Workshops by St Kiril and Metodiy school were focused on seasonal fruit as well as healthy and responsible breakfast. 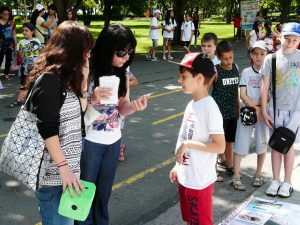 There were several games organized by Mihail Lakatnik school. For example a “Banana Game”, focusing on the topic of fair trade, a “Save the rainforests” game, stressing the problem of palm oil and processed foods, or floor game “Our food choices affect the life on the Earth”. 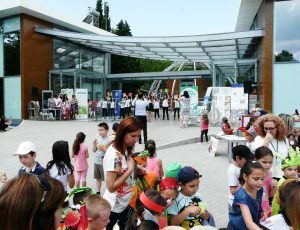 The Zdravetz kindergarten organized a parade with costumes to show the biodiversity of Bulgarian fruits and vegetables. The Bratya Miladinovi school presented their own Model of a Green city and the students participated also in a show with eco-songs and rhymes to present the Sustainable Development Goals. Clearly, visitors were able to engage in a plethora of activities. During the whole festival, visitors were asked many important questions. “How much do you eat?”, “How much do you waste?”, “What do you eat?”, “How was the food you consume produced?”, and “Where does your food come from?”. Students were asking these questions in order to make visitors think about their food choices and their impact. They were also distributing leaflets, flyers and brochures, so that others could bring them home and read through all these new information later on. The Eco festival covered the most important topics of global food consumption, inspiring change in the community. The most important contributors to the event were teachers–without their will and effort, students would never learn so much about all this important topic. Therefore, the final ceremonial of the “Live Responsibly” Eco festival was devoted to awarding the achievements of teachers from these 15 schools for their hard work.